ASL Safety & Security offers analogue and IP-based public address and voice alarm (PA/VA) systems for mass transit infrastructure hubs including airports. Any airport is likely to include a wide range of spaces including general public concourses, walkways, departure lounges, check-in desks, observation areas and immigration. Facility managers are frequently confronted with significant differences in distances between speaker and listener, resulting in a range of delays from the various outputs around a terminal. The implications for audibility are immense. 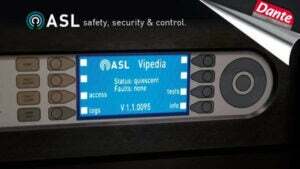 ASL’s Vipedia professional life-safety digital audio system addresses these differences while complying with voice alarm standards including BS EN54-16:2008 and BS EN 5839 Pt8. Installations employ both voice over internet protocol (VoIP) or copper according to whether usage is life-critical or not and there is fail-safe analogue bypass. Line integrity is maintained until the last possible moment in the event of fire. 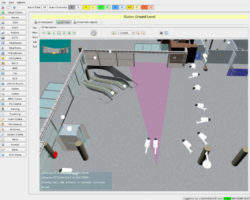 As a 24-bit, 96kHz offering, Vipedia bridges the gap between audio quality required for non-critical background announcements and voice alarm instructions in the event of an emergency requiring orderly evacuation. With unlimited matrix size, Vipedia offers the scalability expected by airports where additional terminals are envisaged. An airport constitutes an extreme acoustic environment with a wide range of announcement and alarm types, differing ceiling heights and exceptional levels of ambient noise from aircraft and support vehicles. Vipedia addresses these challenges through sophisticated DSP functionality that does not compromise life safety. The unit is compatible with the Dante™ audio network and Lab.gruppen products. Vipedia is complemented by ASL’s iPAM product, a dual-redundant monitored PA solution that has been created specifically for transport usage. ASL has integrated routing, amplification, PC/DVA and CIS software functions into a robust VoIP offering. Where necessary, a GUI can be provided by ASL’s mini-iVENCS software which offers a 3D schematic of airport premises. As well as offering core public address facilities, iPAM provides general customer information system (CIS) functionality such as digital voice announcements (DVA) and text to speech. iPAM also supplies network-wide fault reporting to an airport’s control centre workstations. Operators and maintainers receive status information on the PA system and potentially on related disciplines such as CCTV and access control. BS5839:8-compliant voice alarm can be provided using ASL’s VAR router and V400 amplifiers. Client feedback has stressed the benefits of scalability within this architecture, particularly at major airports requiring multiple controls. 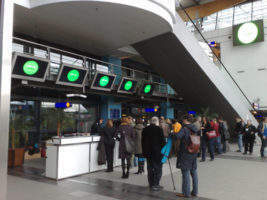 ASL are revolutionising audibility of transport announcements with their DANS system. Conventional noise sensing equipment at infrastructure hubs takes a crude sample of background activity before the broadcast, and cannot adjust for varying ambient noise. But ASL uses DSP to distinguish background noise from announcements, continuously optimising volume levels. As a company focused on the real-life needs of travellers, ASL is aware that passengers frequently have to listen for flight information and paging in a language that is not their mother tongue. The ability to address the problem of garbled announcements confirms ASL’s leadership position in the PA/VA sector. In order to optimise the intelligibility of its PA/VA products, ASL manufactures a full range of voice alarm and public address microphones. Models with customised graphic displays are available as well as units that can be adapted for application-specific usage within sectors of an airport. A touch-screen microphone is available for projects where fully-customised zone selection displays are required. This microphone is based on ASL’s PC/DVA system and can be connected directly for conventional PA use in the manner of a standard unit. It can also use a VoIP approach to broadcast across IP-addressable systems.